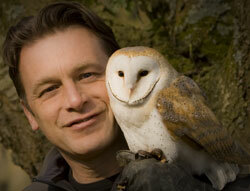 Chris Packham is a naturalist, nature photographer, author and television presenter. He was born in Southampton in 1961, and studied Zoology at the University there, where he describes himself as “A precocious young scientist, swat and nerd in training.” He studied Kestrels, Shrews and badgers throughout his student days. He remains an avid bird watcher. After Post graduation and a cancelled PhD, (“the Badgers were getting a bit much”), he began taking still photographs and trained as a wildlife film cameraman. The photography continues with exhibitions and invitations to judge prestigious competitions, but the camera work gave way to presenting. Chris began with the award winning ’Really Wild Show’ in 1986 and has been working ever since. Credits include ‘Wildshots’, ‘Wild Watch’, ‘Go Wild’, basically lots of things with ‘wild’ in the title. Chris is also an author with a resolute concern for conservation and the environment. He ran a hugely successful production company ‘Head over Heels,‘ making programmes for Animal Planet, National Geographic, ITV and the BBC. He is an award-winning photographer, but being an extreme perfectionist, he is constantly driven to achieve the ultimate image. His photography is intense and evocative.